My commitment to painting the studio objects continues! Palma Rea’s challenge prompted this watercolor sketch. I said no more challenges but her list is too much fun. support seats and backs and arms in upholstered objects. The bottom one pulls the best, because the sharp teeth can lock and pull new webbing, below. When pulling on antique webbing during conservation treatment of museum pieces, you choose the top stretcher, which is gentler on old webbing and also, museum pieces usually don’t have to be pulled quite as taut because they are not sat upon. 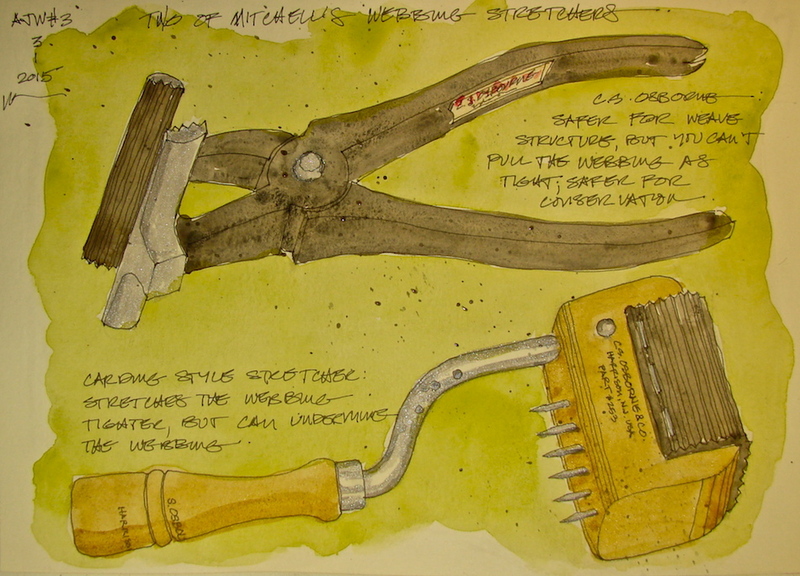 Drawings and watercolors completed onsite in MPF Conservation’s studio. Gallery | This entry was posted in art, conservation techniques, preservation, process, reparation, tools, upholstery and tagged bustle chairs, family heirlooms, Pacific Northwest, Regency Revival, Upholstery Portland Oregon. Bookmark the permalink.